DRAGOON, The second largest invasion ever. reenactment is like the Quartermaster issues sizes; you never know what you're gonna get. For a year we put in lot of effort in preparing our trip to the erstwhile invasion beaches of Southern France. A jeep restoration already lasting three years had to be completed, scouting trips had to be made, rations reproduced, re-enactors had to be interested in participating. We wanted to make this a big event with lots of re-enactors, get some depth and volume in our pictures. But things don't always go as planned. 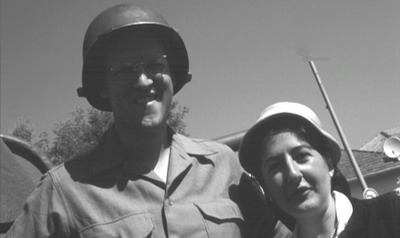 We got the jeep fixed up on time, the rations made, the leave of work approved, the uniforms and gear in order, invasion armbands printed up and all. But when we finally got to France with our 'road train' of two land rovers towing two trailered jeeps, we were just down to our own little group. So it goes. Of all the Provence '44 people who had shown interest and promised they would help and join only one guy actually showed up. So we made sure he at least had a good time with us. Well, there was no time for sour faces. We had traveled a long way, we were in France, at the Côte d'Azur near St. Tropez, the sun was shining, we had our gear with us and so we were going to simply do our own program, carry out our plans and have a good time. After all we were going to be down there for two weeks. Now, it took some doing, some last minute phone calls and beaucoup de bonne chance but we got ourselves a real nice camp site, thanks to Beatrice, the Corporal's Belle. It was actually just off a regular 'at the farm' camp site, close to the camp's facilities but at the same time nicely secluded so we could try to get a little forties atmosphere with our pup tents and small walls. Civvy cars were parked out of sight but close enough to serve as lockers for when we were on patrol. We had brought a couple of folding chairs, courtesy of the Lieutenant, that were thoroughly enjoyed (and wrecked) over the next two weeks. A table was requisitioned (borrowed, yes we asked nicely) from Patricia, the proprietress of the camp site. 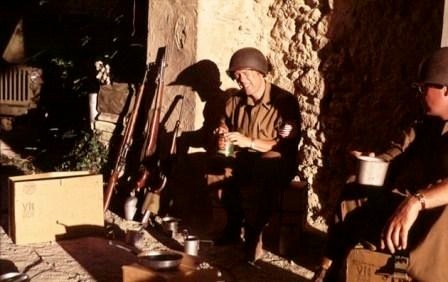 Add a wartime U.S. Army Dietz oil lantern, coffee brewed on a 1944 Coleman stove and you had your regular little Eden and couldn't wish for more. But we did anyway of course, on that fantastic night when we saw all those falling stars. There were so many that soon we didn't have enough pockets. In the morning rather than shells from 88's coming in we had Patricia from the camp site coming in at seven o'clock each day in her little white Fiat I believe it was, with fresh chocolate bread for breakfast. There were none such niceties in 1944. After the landings advance of the Allied forces was surprisingly fast. Objectives for D-Day + 20 were in American hands on D-Day +2. 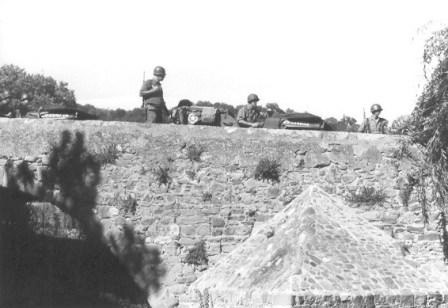 We visited several small villages inland that were in fact liberated on August 15, D-Day itself. So with this rapid advance in mind we traveled very light. 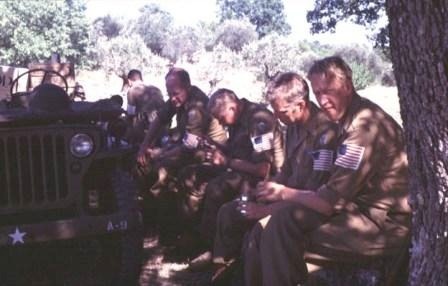 Did a lot of jeep patrols, we dug no foxholes and left our combat jackets at home. During the day uniforms consisted of combat boots, wool trousers, wool shirts with sleeves often rolled up and of course M1 helmet. The 36th division seems to have worn no camouflage netting on their helmets during the invasion of Southern France, whereas period photographs of 3rd division troops that landed at Cavalaire show every Rock of the Marne soldier wearing a fine mesh net over his helmet. It was again, as we found the previous year, surprising how comfortable wool can be, even in a hot climate. And boy did it get hot sometimes. 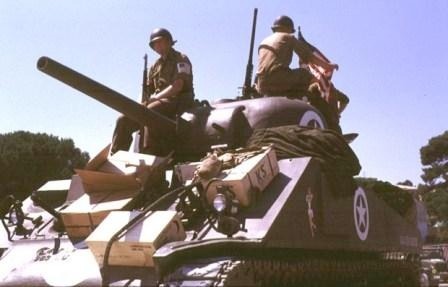 On August 15 we participated in the annual Cavalaire parade and afterwards took some pictures with the Sherman tank that was parked in the local stadium on white gravel, in the blazing sunshine. One of us almost was taken ill by the heat. But as you don't have a Sherman in your reenactment pictures every day we persisted and ended up with a lot of nice shots. Most invasion troops were issued an white oil cloth brassard with an American flag with 48 stars printed on it. We had made up a good batch of these flag armbands on a 10 cm x 44.5 cm strip of material that resembled the original oil cloth well enough. This allowed us to distribute them to fellow re-enactors, people who appreciated our efforts and in the end even sell some. We also cut out the flag part of some of them to sew directly onto our service shirts, a practice that we took from photos in the 36th pictorial history book. This produced a neat pile of authentic garbage and made us wonder how much of these brassard bits ended up in the Naples harbor or the Med along the way to France. Now, in France we enjoy a little fame through our articles in Militaria Magazine. Especially the ration article was very well received. So in order to get French re-enactors interested in participating in our little event to make it a big event we promised to have with us the best K's and 10-in-1's we'd ever made up so far. Harry made up a full crate of 12 rations, i.e. 36 boxes. He had just printed our new and much more authentic K ration design, Breakfast, Dinner and Supper, based on an original 1943 K ration box I bought in Cavalaire last year. The 12 sets went into a cardboard box which in turn went into a wooden crate that was nailed shut after which steel straps were put on, all just like the originals at the time. I on my part made the two best 10-in-1 rations to date. However, for the ration copy nerds among us; I did make a mistake I found out later. Having recently received a copy of the packing specifications for the 10-in-1 from the Quartermaster museum in Fort Lee, Virginia, I noticed I put the steel straps on the wrong way. The long horizontal strap should have gone on first, then the short vertical strap. Better next time, practice after all makes perfect. Sadly in spite of all this and other preparatory effort from all us Dutch Texans, few people showed up so we ended up not eating any K's and only one 10-in-1. But we did use the ration boxes for props. Several wooden K crates had been made up and were used for all kinds of things. One served very nicely as a wind breaker for our Coleman burners. Others were used to store our supermarket supplies, and civilian clothing. On one trip we had so many ration boxes we decided to fill a jeep as if it was taking rations up to the front line troops. A very impressive sight, even if I say so myself. 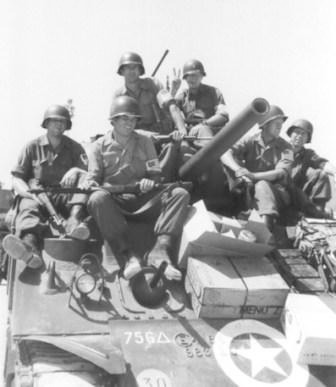 And seeing the still full and strapped 10-in-1 on that Sherman tank didn't look bad either. Another bonus of dressing up as GIs and try to do it well is that you get invited by people who appreciate what you are doing, to have a drink at their house. Or they are willing to share what they remember of the war. Like Ms. Stevens, daughter of an Englishman, who still resides in the family mansion at Valbourges la Motte, a grand old estate that may well date back to Roman times. It was in the fields in front of the mansion that the 517th PIR landed in the early morning of August 15, 1944. First the paratroopers, later the gliders. The inner court of the mansion was covered with straw and served as a hospital of the glider crash casualties. And there were many, much more than battle casualties. At another location along the actual route the 36th must have traveled we met a gentleman who spent two years in Mauthausen. It 'did his heart good to see all this again' meaning us dressed as GIs and the two jeeps. He gave us a bottle of wine and we will send him a few of the pictures we took. As we will Ms. Stevens. Two weeks seemed a long time but suddenly it was all over and we took down the tents, packed it all in, saddled up and rode off into the sunset. Yadidadidah.